The faculty in the PE department teaches beyond the text books by offering many volunteer opportunities to build your professional experience. They make learning FUN! This class allows for flexible and self-paced CPR training. CPR training is traditionally done in groups but this class allows you to stop and review information to be sure you have complete understanding of the instruction. You can also go through lessons in full or abbreviated form or even test out of lessons. This is especially valuable if you're re-certifying. Each blended learning program course is divided into two sessions. You complete the first portion on-line, from any computer. For the second part of training, a Red Cross trained instructor will conduct a skills practice and assessment with course takers. The online session takes approximately two to three hours, depending on the pace of the student. The skills practice and assessment session takes approximately two hours, depending on the particular course being assessed. For more information please reach out using the contact form at the bottom of this page. The skills review and testing session is offered during a one week window after the close of the online portion of the course (typically the last 7-9 days of the month). Sign-up for the skills review &amp;testing session occurs just prior to the start of the online portion of the course. The length of the skills session will vary depending on the content being reviewed and evaluated. On average, the testing sessions will be for 3 hours (full course, Adult/Child/Infant CPR/AED and First Aid). Multiple sessions will be offered on a first come first serve basis. The number of participants for each session will be limited to 12. If a minimum of 3 participants do not sign up for a session, it may be canceled and the participants would be moved to another session. Complete the class registration form and return it to either McPhee 208 or 213 with payment. Payment must be received in full to be registered for the course. All registration materials are due a minimum of two days before the start of the online portion of the course (dates to be announced). The cancer recovery and fitness program aims to increase the quality of life in cancer survivors by supporting individuals physically, emotionally, and socially through exercise with students trained as cancer fitness specialists. 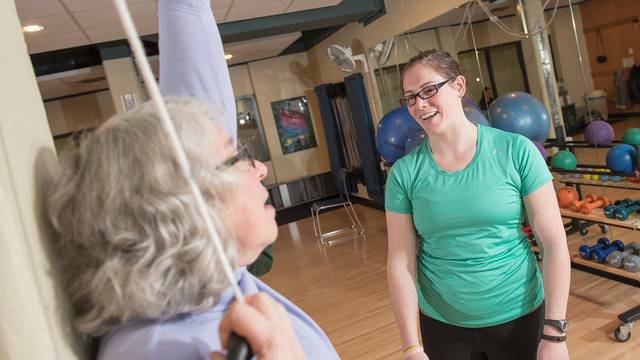 In collaboration with the Marshfield Clinic Cancer Care Survivorship Program, and the Mayo Clinic Health System, the University of Wisconsin-Eau Claire is proud to offer an exercise recovery program for cancer survivors. Supervised by Professor Matt Wiggins of the Department of Kinesiology, the Cancer Recovery & Fitness program is designed to help survivors reduce fatigue and build up their endurance either during or right after their cancer treatment has ended. Services in the program include a personalized fitness plan, exercise with qualified personnel, and measurement of the physical and psychological impact exercise has on the participant. The Cancer Recovery &Fitness Program is conducted in the McPhee Center on the UWEC upper campus. Referrals to the program are necessary, and can be obtained from Nicole Pickett with the Marshfield Clinic Cancer Care program (715-839-3956), or through the Mayo Clinic Health System Cancer Center (715-838-6072). For more information please use the contact form at the bottom of this page. Here are examples of upper body and lower body stretching exercises specifically designed for cancer survivors. Faculty and students in the Department of Kinesiology at the University of Wisconsin –Eau Claire (UWEC) offer morning exercise programs for adults who desire some supervision, direction, education, and camaraderie in their health and fitness efforts. Our vision is to help improve health and wellness in the Chippewa Valley by providing an exercise program for those who are interested in improving their health and fitness and/or desiring more structure in their workout efforts. We aim to get you feeling better, stronger, and more energetic. Those who have completed rehab in a hospital or clinical setting, but do not yet feel ready to just exercise on their own - this will be an "in between" program to help you reach new independence! Any adults who need a structured exercise program with group support to begin the process of improving their health - this may be the "jump start" you need! Leadership is provided by UW-Eau Claire students who are majoring in exercise related fields. For more information, see forms below or please reach out using the contact form at the bottom of this page. Greetings! The Department of Kinesiology at the University of Wisconsin-Eau Claire will once again be offering physical education classes in the fall of 2018 for children educated at home. Classes will focus on health-related physical fitness and motor skill development. Students majoring in physical education and movement studies will be instructing the children under the new direction of Ms. Robin Cowden. Class sessions will be held on Tuesday mornings, from 9:45-10:30am in the McPhee Center on UW-Eau Claire’s upper campus. Dates for classes are as follows: September 25; October 2, 9, 16, 23, 30; November 6, 13, 20, 27; and December 4, 11. Costs will cover postage, supplies, and equipment, etc. Sliding scale registration is available for those with financial need. Please contact Dr. Oh (yoonsin@uwec.edu). Documents to Complete: Registration Form (below), Medical Health History, Photo & Video Consent Form, and Payment. Our students are videotaping themselves to reflect their own teaching during homeschool PE. Please sign the consent for our students’ learning. All forms need to be completed and up-to-date before participation in the first PE class session. Be advised NOT all children in this program are vaccinated. After the September 7th early registration deadline, you will receive a confirmation packet in the mail, with a confirmation letter, parking pass, campus map, and receipt of payment. Thank you, and we look forward to teaching your children! Use the contact form at the bottom of this page for involvement in the homeschool education program. Since September 2005 students enrolled in KINS 361 Physical Education and Health Education for grade K-5 students have administered a before school exercise program for Eau Claire elementary schools. The program first began at Putnam Heights in the fall of 2005 and since then we have administered the program at Flynn and Longfellow Elementary Schools. The program is set up to give young children an opportunity to exercise before school begins. Research has proven that exercise before school helps students to be more prepared and ready to learn. In addition these young children are learning the importance of living a physically fit lifestyle at a young age in hopes that this positive experience will carry over into adulthood. The KINS 361 students are responsible for everything related to administering the program including: keeping track of laps run, participation levels, and conducting three different promotional events throughout the semester. We are pleased that the program has been very successful and embraced by the students and faculty at all three elementary schools. Our ultimate goal would be to have a program like this at every elementary school in the Eau Claire Area School District. For more information fill out the contact form at the bottom of this page. The P.R.I.D.E. program serves children with cognitive, sensory, and physical disabilities ages 5-16 years by providing individualized and/or group instruction in the areas of skill development, fitness, and sport/recreational activities. Individualized programming for each child is based on initial screening, ongoing assessments, and consultation with parents, teachers, and related service personnel. Each child receives individual instruction, attention, support, and encouragement from UWEC undergraduate students. The program is suited for children with a wide variety of ability levels. The children participating in this program will be recruited and/or referred from Physical Education/Adapted Physical Education teachers, physicians, therapists, and families. Provide children with disabilities individualized instruction that will assist in the development of specific movement skills. Provide children with disabilities an opportunity to continue working on skills that are being addressed in their physical Education or therapeutic settings. Provide children with disabilities an opportunity to learn that their disability does not have to limit them from participating in physical activity. Provide UWEC students the opportunity to work with children with a wide spectrum of movement abilities. Provide UWEC students the opportunity to develop understanding of the meaning of community service and an appreciation for serving others. Provide UWEC and the surrounding community with an opportunity to enhance, strengthen, and highlight the importance of physical activity for children with disabilities. The P.R.I.D.E.4Adults program serves adults with disabilities older than 17 by providing them an individualized exercise program. The exercise program consists of an aerobic, resistance training, and range of motion components. Overall, evidence shows that exercise provides important health benefits for people with disabilities. The benefits include improved aerobic and muscle fitness, improved psychosocial health, and better ability to do tasks in daily life. Individualized programming for each participant is based on an initial screening, interests, and referral information. Participants receive individual/group instruction, attention, support, and encouragement from UWEC undergraduate students supervised by a university faculty member. The program will be suited for adults with a wide variety of ability levels. Use the contact form at the bottom of this page for if you want more information about P.R.I.D.E. for adults. Provide adults with disabilities individualized instruction that will assist in the development and improvement of their fitness. Provide adults with disabilities an opportunity to continue working on areas of fitness that are being addressed in other rehabilitation settings. Provide adults with disabilities an opportunity to exercise and interact with others in a safe, fun, and relaxed environment. Provide UWEC students the opportunity to work with adults with a wide spectrum of movement abilities. Provide UWEC students with learning opportunities that prepare them for professional school and/or their future professions. Provide UWEC and the surrounding community with an opportunity to enhance, strengthen, and highlight the importance of physical activity for adults with disabilities. A service project that put her in touch with cancer survivors has helped Blugold Heidi Kafura rethink her future.